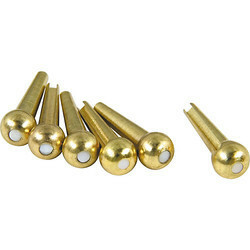 Prominent & Leading Manufacturer from Pune, we offer brass bridge pin. We put forward a broad range of Brass Bridge Pin that is manufactured in adherence with the set industry standards using advanced technology and optimum quality raw material. In tune with industry quality standard, we provide the entire range in various sizes and specifications, as per the requirement of our clients. Our quality controllers perform a series of test on various parameters, in order to ensure the quality of these cylinders. Apart from this, clients can avail the entire range of pin from us at industrial leading rates.